In January, I went to the Queens FEMA office with one of my SRL colleagues to present on our research during a big meeting in their “situation room”. It was a pretty big room, with a lot of screens. I thought I’d post a visual excerpt from the presentation here, as I’ve been thinking through different metaphors one might use to describe multi-actor research and still not sure this is the right one. Here’s the basic idea. On the one hand, it’s obvious that in research one would speak to many “actors”. But in practice, a lot of academic and policy-oriented urban studies, especially qualitative ones, end up being studies of a particular (sometimes “representative”) group, like people in a poor neighbourhood, or elites, etc etc. This allows the researcher to focus closely, which in this presentation I said was analogous to photographers using a shallow depth of field. It puts one actor in focus, while blurring out the background. Meanwhile, some sociological studies, and many of the most famous novels about cities, like Dickens’ Tale of Two Cities, are totally different. Their whole effect comes from contrasting the clashing experiences and subjectivities of people from different groups (in A Tale of Two Cities, it’s high and low society in both London and Paris). In the presentation, I argued that unlike most qualitative studies of Superstorm Sandy’s aftermath, our Research Lab had taken this multi-actor approach to try to get an encompassing picture of the city’s overall response, including clashing experiences and subjectivities. Authors of fiction can do this easily, since they make up their stories. For individual qualitative social scientists, it’s hard to find the time to track multiple groups. But in a mutual aid group like Superstorm Research Lab, we could divide and share our labor to cover more ground. So we interviewed people form government, established civil society, volunteer responder networks (mainly Occupy Sandy), and people directly affected by the storm (especially in Coney Island). It was this approach that yielded our discovery that there had been not one, but Two Sandys, each of which was a really distinct understanding of the storm, with important implications (as our report elaborates). We could think of this approach as extending our depth of field, which reduces the contrast in focus between foreground and background (ultimately, putting everything in equal focus). In cinema, this approach’s full potential was pioneered by Orson Welles’s Citizen Cane. I think there’s a connection between the cinematography and the film’s clarification of extreme social contrasts, but that discussion is for another day. 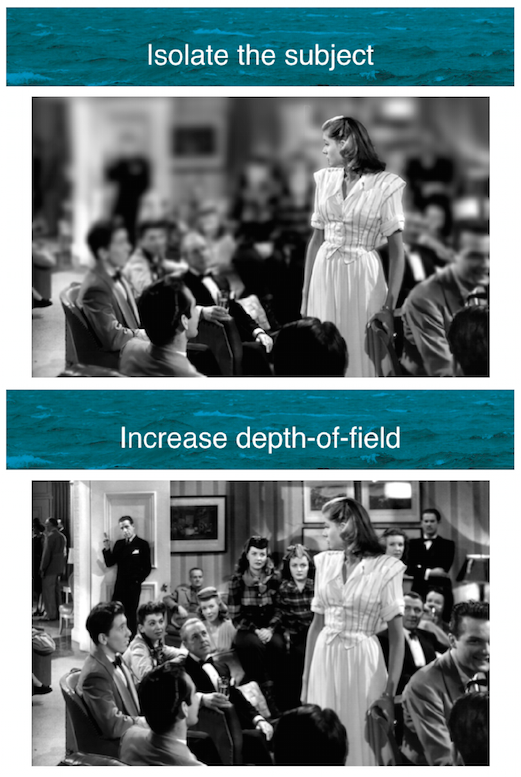 To make my point in the presentation, I showed the two images, pasted above, from the Humphrey Bogart film The Big Sleep—using photoshop to simulate a shallow depth of field in the first image. What I loved about the way these turn out completely differently, once you restore the proper depth of field, is that you don’t just see more actors when everyone is in focus. You see, a) more sets of relations between actors; and b) some of those relations are invisible to the actors themselves. In works of fiction, especially tragedy, we often call instances of this second situation dramatic irony. In qualitative social science, it’s just tragic that researchers rarely make the efforts to study, all at once, multiple actors (and their points of view).